On the holy occasion of Navratri which is commencing tomorrow i.e. from the first day (Pratipadaa) of this Ashwin Navratri, Shraddhavaans can rejoice with even more fervor. There are gifts which are ready to be showered on them. Firstly we are releasing the much, much awaited Audio CDs Pipasa (पिपासा) , Pipasa 2 (पिपासा २) and Pipasa Pasarli (पिपासा पसरली). Secondly, we would also be launching our very first e-commerce website, actually an online book portal from tomorrow which would enable the Shraddhavaans to order ebooks viz., Krupasindhu (English and Gujarati), The Third World War by Dr. Aniruddha Dhairyadhar Joshi (Aniruddha Bapu), Textbook of Disaster Management (the reference book for certificate course of Disaster Management which is conducted by Aniruddha’s Academy of Disaster Management). 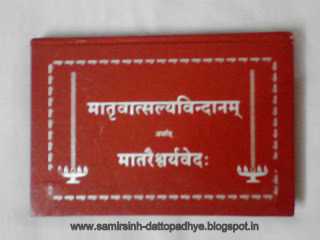 I would be announcing the name and web address of this site tomorrow after the aarti from my Blog and Facebook account. It is our endeavor to make available the physical delivery of the books too and every effort is on in this direction. We hope to start this service by Datta Jayanti. The present payment gateway offers books to be ordered by Net Banking as well as Debit Cards, The Credit Card payment option is expected to start by the end of next month. Hari om Dada, Shreeram for these most awaited gifts. Shree Ram Dada… ! Thanks a ton for thus great news…! Rhanks Bappa, Dau and Aai…! I was eagerly waiting for Pipasa…. Eagerly awaiting for these CD's..my favorite abhanga in Pipasa Pasarli – Anirddha Mazha Vithu Pandharicha…all abhangas are very good in all the three CD's. Hope we get it online in coming time..
Shreeram Dada, I have been eagerly awaiting Pipasa1 , 2 and Pipasa Pasarli they have some really nice abhangas , songs. Hope we start getting these online too… for oversea's bhakta the website is going to be big big boon…as we can get an opportunity to read Krupasindhu every month. Would like to congratulate the entire team for putting this up. हरी ओम आणि खूप खूप श्रीराम ! HARI OM, DADA. You have given us abundant treasure of happiness . There are no bounds of joy to know that PIPASA AUDIO CDs are available now again. We were eagerly awaiting for these CDs. PIPASA PASARALI will be bonus for us. Both are really great news ! We are eagerly waiting for the legendary Pipasa and finally the wait end today. Also online book store is amazing and very futuristic idea. Hats Off !! आज नवरात्रीचा पहिला दिवस, श्रवण भक्तिचा दिवस! आणि आजच आम्हा सर्वान्ना ही अनोखी भेट दिली. आद्य पिपा दादांचे श्रवणीय अभंग आज पुन्हा एकदा आपल्याला ऐकायला मिळणार! श्रीराम!!! Dada its really great news.Now because of e-commerce website we can order the book from remote location. extremest happy dada! Extremest! I have no words to thank you.literaly i am speechless..the most awaited PIPASA..OH MY GOD! I am so happy. Thank u so much dada.thank u..shreeram. This is awesome news Dada!! Hari Om! Dada, Its a great GOOD NEWS indeed. With the everyday technology upgrade, the e-commerce is taking over almost all the physical offices and stored. I am glad to see this portal up and running. Awaiting for the further details.. Bappa blesses.